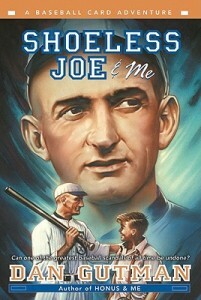 I picked this children’s book up because I had heard of Shoeless Joe, and was curious to see what I would learn. I didn’t realize I had stepped into the fourth book of a collection of ‘baseball card adventures.’ Happily, the author quickly gets the reader caught up to the scenario, so that it doesn’t really matter which children’s book you start with. Given that we all have preferences for our baseball heroes, this makes a lot of sense. The series seems to be a cross between historical fiction and fantasy. The fantasy is the time travel part; the historical fiction is that we do go back to whenever the particular baseball hero was living. The general point of the story seems to be to let us find out more about the baseball hero, and learn to accept the past as the past. I enjoyed the book, since all the information in it was both accurate and new to me. I imagine that for any one who is a big fan of baseball, and baseball cards, this children’s book series would score a home run. Especially recommended for reluctant (boy) readers!